From the crunch of the sugar crust on the bottom, to the juicy cranberries, to the flaky cake layer on top; Nantucket Christmas Cranberry Pie is cranberry dessert heaven. This recipe was sent to me by a reader, Maureen. She saw our Cranberry Christmas Cake on Facebook and it reminded her of this pie. She thought we might like it and she was right. It proved to be irresistible! My whole family LOVED this pie and I even ate it again for breakfast. That’s how much I enjoyed it. If you can’t decide whether to make cake or pie, this recipe is your answer! Crunchy pecans are added to a mixture of tart juicy cranberries and sugar, then topped with a buttery batter to make ta dessert that’s a little bit cake and a little bit pie. Is it a pie-like cake? Is it a cake-like pie? I don’t know but I do know that it tastes phenomenal! Have you ever made cranberry pie before? I admit that it’s not the first thing I think of when I think of pie but it makes total sense. We eat a lot of cranberries around the holidays and even more pie so why not put the two together? This Cranberry Pie recipe is also far less fussy than your typical Christmas Pie. 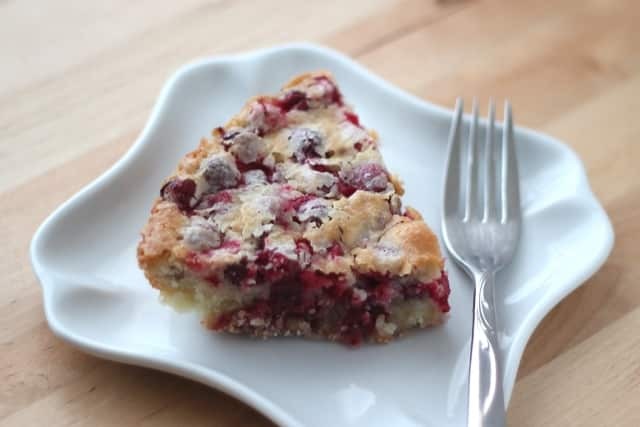 Instead of rolling a delicate pie crust, you simply pour the cranberry filling into a pie pan and top with a batter made from butter, eggs, sugar and flour. The resulting pie is begging to be served with a scoop of vanilla ice cream or a dollop of fresh whipped cream. Of course, it’s also perfectly delicious all on its own! When you’re surrounded by decadent, sickeningly-sweet desserts during the holidays, Nantucket Cranberry Pie is a nice change of pace. It’s still plenty sweet and pleasantly rich without being cloying or heavy. It works as a dessert and as a fun breakfast or brunch dish. I’m not too big on sweets and this pie was just right for me! 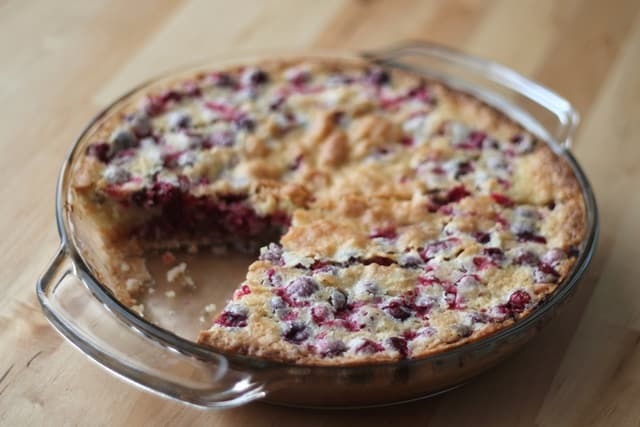 This pie is a fabulous way to cook fresh cranberries but frozen cranberries work just as well! Lots of us snack on dried cranberries all year long but don’t do much with the fresh berries until it’s time to make Cranberry Sauce around Thanksgiving and Christmas. I love our traditional Homemade Cranberry Sauce and all the new versions I’ve experimented with over the years like this Hot Pepper Cranberry Sauce. Fresh cranberries are for more than just sauce! ‘ve enjoyed exploring different ways to use these tart berries. Some favorites include Overnight Baked Oatmeal with Fresh Cranberries, Cranberry Pepper Jam and the aforementioned Cranberry Christmas Cake. Fresh cranberries are also fantastic in many savory dishes like One Pan Cranberry Chicken and Cranberry Sausage Stuffing. I’ve made this pie with all-purpose flour and a blend of gluten free flours. It turned out great both ways. I’ve listen the gluten free flours I used in the recipe below but if you’re not after a gluten free recipe, feel free to just substitute each of those ingredients with all-purpose flour. For more pie recipes you might love, check out my Pumpkin Cheesecake Pie, Lemon Angel Pie, and German Apple Pie. Apple Pie Bars with Bourbon Caramel Sauce are another fun and tasty take on traditional pie. 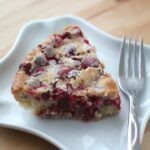 For a simple yet beautiful pie bursting with seasonal berry flavor, try this Deep Dish Berry Pie. Combine the butter and sugar in a mixing bowl and beat until smooth. Add the eggs and beat again until fluffy. Add the flour and almond extract and beat once more. Spread the thick batter over the cranberry mixture in the pan. I used a small cookie scoop to quickly dollop spoonfuls across the top of the pie. It doesn't need to look perfect. Bake for 35-42 minutes, test doneness with a toothpick, just to make sure the topping is cooked through. Serve warm with whipped cream or vanilla ice cream. Enjoy! Can I substitute the cranberries for other berries? This will work with other berries, however, it won't have the same sweet and tart balance that the cranberries give it. Made the pie today, Christmas morning. Very easy. Haven’t tasted it yet but it smells delicious. Thank you for sharing. I made this pie for my family and OOOOMMMMGGGG!!! It is absolutely fantastic!! I made this with Laurie Colwin's original recipe when I didn't have to be gluten free. Sighhh. So long ago that I only vaguely remembered what it was like. I do remember it being a little more cake-y though. This was a very good copy! Believe me, it will be gone in a day or two! I have so many cranberries frozen that I think I will try it again, with just a pre-made gluten free flour, like Better Batter. I usually have pretty good luck with that one. It is a trial to be a former baker with ordinary flour and have to try to convert my favorite things. So your efforts are greatly appreciated!! And yummy too! Thank you. I am so glad it was helpful, Alene!